“Oh that’s interesting. So what are you going to do? Illustrate science textbooks or something?” This was a typical response to my choice to major in chemistry and fine art. My answer varied from, “Yes. ” (easiest and least confrontational) to “No” (not in the mood and likely off-putting) to the truthful “I’m not really sure.” I really had no plan at the time, but I did make attempts to marry the two. There is a lot of visualization in chemistry, particularly organic chemistry. An organic chemist colleague of mine, Stephen Fearnley, and I chat about chemistry a bit on the LIRR from Brooklyn to Jamaica. I’m definitely very, very rusty but one thing he said recently reminded me how art and organic chem do relate. “Organic Chemistry is still a very pencil and paper subject. Lots of drawing of chemical structures, arrows pointing to where electrons are going, showing changes in molecules, etc.” I would often put structures in my art notebook and began to qualify chemistry statements and rules with my own authoritative interpretations. These word plays on the rules of chemistry lead to a lot work related to science, art, and safety. PSI, ψ (pictured above) is about the mathematics used to describe an electron in orbit around a nucleus. It was to be part of an installation I proposed for the Holy Cross science building atrium between Swords and Haberlin Halls. It was rejected by Father William O’Halloran which I discussed in my first post to this blog. PSI, ψ is a 47″ x 60″ block of painted plaster adhered to gypsum board mounted on a two by four frame. 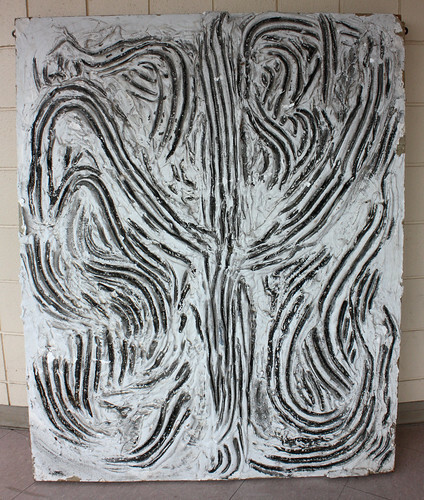 It’s like a relief painting with deep grooves and ridges, so I decided to use it as a printmaking block rolling white acrylic paint and pressing black paper to make a white “thumb print.” I made about eight prints with the goal of using the block and prints for the installation. None of the prints remain. 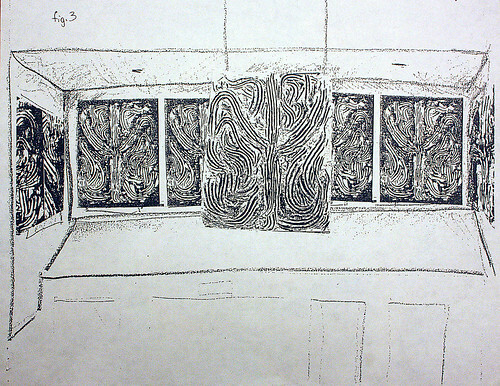 This mock-up for the installation was attached to the proposal, but shows how the suspending block was to be the nucleus, with the prints surrounding to create the electron cloud.